2 MORE AWARDS FOR KING BILLY! King Billy Casino, Astralbet, Babe, Casimba, Fantasino, Gunsbet, Highroller, Joreels, LuckyNicky, Malina, PlayOJO. King Billy Casino, Betsson Casino, BitStarz , Bob Casino, Cashmio, Fable Casino, Lapalingo, ShadowBet, SlotsMillion, Videoslots. The quiz: What is the only casino to be in both lists? The answer: Yes, it is your beloved King Billy Casino! Yes, King Billy Casino is the only casino that made the giant leap from the Best New Casino finalists list to the “big boys” finalists list this year! And we were not there just to “decorate” the lists, mind you! 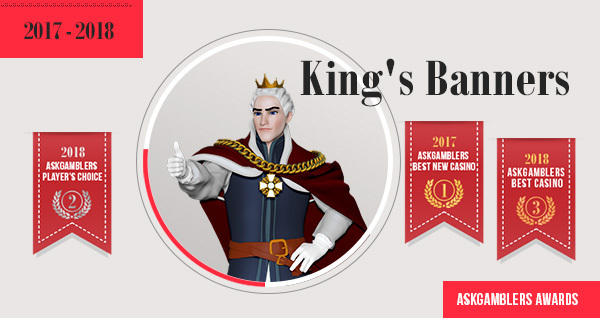 Last year, King Billy Casino was the Best New Casino in the AskGamblers Awards! This year, we took home the Best Casino – 3rd place AND the Player’s Choice Casino – 2nd place Awards! At King Billy Casino, we know very well that once you reach the top, it is very hard to stay there. And this is why, in our second year of operations, we doubled our effort, we doubled our energy, we doubled our commitment and our diligence. And, yes, it has paid off. And boy, are we happy! So, where do we go from here? Back to work, as always! To triple our effort, to triple our toil, to sweat more and give you more! THIS is how we will keep offering you the crème de la crème of services, bonuses and promos! Finally, all the awards we have brought home, and all the ones we are going to bring in the future, would not have been possible without you, our beloved players. Our best allies and strongest critics, who help us become a little bit better every hour of the day, every minute of the hour! Thank you, our 200.000 Citizens who have made this possible! We would like to thank each and every one of you personally, but this blog entry would be longer than the complete Game of Thrones book series! So, we will limit ourselves to thanking personally, and one by one, the following Kings and Queens, Princes and Princesses, Dukes and Duchesses, Barons and Baronesses! Thank you… 80knight80, 838abc, aaron519, absolutemuppet, acesforprayers, Adzzzy, ahsagh, AJspaldz, Aleksi, Alex1505, Alexon, alon852, alyen13, amberrosepoduti, Amy1984, andifuss, Angellee2994, Aniqo, Annam123, Антон Zanosbabos, Antwee, Arko, b0kch01, Badeljev, Barbs, BARJASS, bart77, BastiHH123, Bb1983, beecher97, Bels, berntis43, Bielbs, billabong6, Bjhads, blhammond, bno006, Bobec, Bonnici, Boof, Booticall, Booticall, bothektiek, boubouh, Brent30, Brittneyd, Brodes, Bruza, buramanija, Buratina, butler, Cannibiztiggs, caspobilly, Cassandra, catfishh9, Cathy55, Caulf21, cegan79, cendaprnda, Chauvantran1959, Chea1980, chizie, cico21, Clav12, corinne3793, costaricas, Cristmas, Croc, Cryptus33, Cuongy, dan, danludan, Dannagy, Dannii, dantheladder, dariuszgolec1, darkorse69, darlean69, Data20, davorin, Dawson, dawwe75, Dccamp, Deemz, deffbe, degrov, Deppeler, Despacito, Devo69, Dibyad, didier1975, Dinciza3, Dirtyarab, Dizzley13, djb87, djb87, Djekson_74, DJWILD, DK00, dmcjordan, Donjohnjoe, Donna, donnaclark, Doondy2810, DOOOONTER, , drdig, Dreadedgiraffe, Drjaes, dublinjeffers, Dxxix, Dyssegaard, Ebutterw, Edman, electricash, Elizaki1980, EMMA, ent77, epenian0408, erikenflap, eskallio, Eyebelle, Fannie88, FAZIII1, Fedearne, Fergo, Feyenoord26, Fgordon78, FlockeDerBoss, Fon123, Fortoviy, Franga, Frankiepic, Freddie, Frequ267, Galeonster, Gargatoon, GBO, Gecht, gillies, gogtsu, golfpunk, Greg, Grietje30, Grubasisko, grzesiu23, halaal08, hans123, Hany18, hanziwolf, harilaos13, harl3kin, Havagou2, Hawka74, Hawkins91, HayleyDarrin, Heiko, hellasole, hellother, Henkka82, HeyI’mgoing, hezekiah1, Hickey13, hrrmony, Hulluhellu, Hyvonk, ihoeppner, Iliuxa, Indrek, ivegotkidstofeed, Iwin2121, Jaanamarii, Jackie, Jacqui9939, Jamaica0007, Jamethai888, Jamzie1er, janelink, jankokiraly, Jasmine, Jaycecooper, JayDee, JAYJAY, jb200490, jct90, jehis77, Jeremiah, Jessmarie89, jkjuhlin, jlourencorp, Jms123, Jodie, Johnnysav, Jscrewz, Juice1318, Jukka, Jupiterscage, Just, juzzie71, jwin79, Kahlia, Kalaiswgn, kamilsword91, Kangas2017, Karssen, Kathy81, Kazillma, KB, KBdedi, Kel, Kent, KERMY79, Keymp18, kianatelisa, KingLud, KingREeza187um, klauwhamer666, klu, kolcz91, kotsiosniaou, Koullis, KraKraab, Kristel13, Kristoan, ktom, Kudinjo, kume97, Kusmetcho, kvicsi, Labouche79, lajk69, Lakkis, Lassek1, Latfun, lauchboy1, laurynas32, Lauurr, Laylatony123, Le6ix, levi, Lewn777, lisara, Lloyd, Longsta, Luccii334, Ludwator, Ludwator, Lukeye82, Madeirense, Mafiotul, magdaone, malishis13, Maradona87, marathon, marcintiger83, maria74, Markey, marmazoid, Marpur, maskazergon, Massi, Matt, Matt18, Maz, Melee19, MelLaz, Melodye77, Memphy89, merlin1977, mia1158, Micha02, michalsk, Michr, Micky, Miff, Miko Juha Tapio, milanR, Minzdrav87, Mishmm, Mjhmjh, Mocherie, mofeta, Mojoe3, Monique0099, Montanna, Morgan, mortician, motomadmx, mproar, mproar, MScofield960, Msphoe88, MuzzaT, Mvalton, mylda, nards828, Nate, natiteplova, NatJov, Naturelife, nazoking, NebulaF1, Neeka029, Nena, nhjy, Nickyy, nicola68, niigty, Niknak, Niko90, Nina, nizzujpc, Nobby125, NoGarD, Non, nufasiken, oliver70, opozdal, orange2016, Owlwinner, Pacind, Paddypc21, PangPang83, paps, Passukka, Patrick_no9, Patrilla88, paula777, Pearl, Peka70, Peksi, ph7778, Phil, Pikaheo102, pixie2007, Рмв, pokiesking, PooPoo, poppyzbrite, Posha, pprt558, primeravend, primetime23, PUPPY, Quaka91, Queenie1979, raashid, Rambot, raqvas, raslon, ratapcom Rawi007, Razo, Regi202, Renz032, Retsac84, richard1995, rivich, rnoguito, ro0tsrock, rolas, RoseFlower1234, Rossy, RPMSCH, Rudolf1994, Ruru, Sades24, sam2703, Sammii323, sammiilusty, sandrel89, Sannasu, Sarahsez89, Sarahxx, Sarzza88, Schach83, schamixx, Schmift35, Scottkc, ScottyObigwins, sears, seaweed007, segamania, Seko074, sgibbsy, sharksistem, Shittttt, shogunz, Shortyduwop, Sian92, Snapi, Solsikke68, Sompster, Spaz1234, Spook, Staceym84, Steka1612, Stella999, steproma, Suchi111, Suhmuli, Supertaxrat, Suphatson, survival8, Survive05, Syries, Taane81, Tahlia88, Tahliajae, Tai, Tanners, Taratina, tazza, Tbomb,Td3r90, Teganbrown, Thanh0,,thebinch, Thebo5s, theend, thekingofslots, theraz101, thetsio, Thunderboy, tibici, tima27, tizzy, Tjluger, Toby15, Tommi, Toni, Touner, Trankida41, Ttnguyen, tuanvu1959, Tuhua, Tyoe01, Uasq, Unknown, veehsdfsdfsafsadfasdfasdfasfd, venicius79, Ville, Vwv, Warmo93, Webby711, WhiteTrash, Widya87, Wiebje76, wiecek1,wiitigoo, Wiker007, winterkoning, wolfgang, Wooblar, Xziste, yaking, Yardre, ykidude, Yoblack, you_loko, Young1688, yourmcm, yuliana, Zamor0187, Zanosbabos, zion00, zoran1111365, zzsuugabubus! The. Best. Is. Yet. To. Come!